Boulder, Colo. — Major clusters of summertime thunderstorms in North America will grow larger, more intense, and more frequent later this century in a changing climate, unleashing far more rain and posing a greater threat of flooding across wide areas, new research concludes. The research team drew on extensive computer modeling that realistically simulates MCSs and thunderstorms across North America to examine what will happen if emissions of greenhouse gases continue unabated. The study was published Nov. 20 in the journal Nature Climate Change. It was funded by the National Science Foundation, which is NCAR’s sponsor, and by the U.S. Army Corps of Engineers. Thunderstorms and other heavy rainfall events are estimated to cause more than $20 billion of economic losses annually in the United States, the study notes. Particularly damaging, and often deadly, are MSCs: clusters of thunderstorms that can extend for many dozens of miles and last for hours, producing flash floods, debris flows, landslides, high winds, and/or hail. The persistent storms over Houston in the wake of Hurricane Harvey were an example of an unusually powerful and long-lived MCS. Storms have become more intense in recent decades, and a number of scientific studies have shown that this trend is likely to continue as temperatures continue to warm. The reason, in large part, is that the atmosphere can hold more water as it gets warmer, thereby generating heavier rain. A study by Prein and co-authors last year used high-resolution computer simulations of current and future weather, finding that the number of summertime storms that produce extreme downpours could increase by five times across parts of the United States by the end of the century. In the new study, Prein and his co-authors focused on MCSs, which are responsible for much of the major summertime flooding east of the Continental Divide. They investigated not only how their rainfall intensity will change in future climates, but also how their size, movement, and rainfall volume may evolve. Analyzing the same dataset of computer simulations and applying a special storm-tracking algorithm, they found that the number of severe MCSs in North America more than tripled by the end of the century. Moreover, maximum rainfall rates became 15 to 40 percent heavier, and intense rainfall reached farther from the storm’s center. As a result, severe MCSs increased throughout North America, particularly in the northeastern and mid-Atlantic states, as well as parts of Canada, where they are currently uncommon. The research team also looked at the potential effect of particularly powerful MCSs on the densely populated Eastern Seaboard. They found, for example, that at the end of the century, intense MCSs over an area the size of New York City could drop 60 percent more rain than a severe present-day system. That amount is equivalent to adding six times the annual discharge of the Hudson River on top of a current extreme MCS in that area. Advances in computer modeling and more powerful supercomputing facilities are enabling climate scientists to begin examining the potential influence of a changing climate on convective storms such as thunderstorms, building on previous studies that looked more generally at regional precipitation trends. For the new study, Prein and his co-authors turned to a dataset created by running the NCAR-based Weather and Research Forecasting (WRF) model over North America at a resolution of 4 kilometers (about 2.5 miles). That is sufficiently fine-scale resolution to simulate MCSs. The intensive modeling, by NCAR scientists and study co-authors Roy Rasmussen, Changhai Liu, and Kyoko Ikeda, required a year to run on the Yellowstone system at the NCAR-Wyoming Supercomputing Center. The team used an algorithm developed at NCAR to identify and track simulated MCSs. 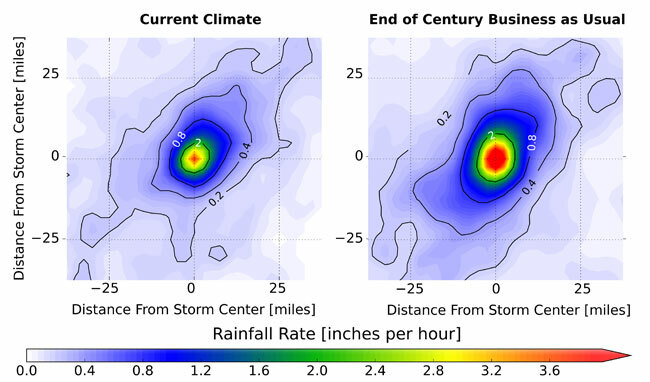 They compared simulations of the storms at the beginning of the century, from 2000 to 2013, with observations of actual MCSs during the same period and showed that the modeled storms are statistically identical to real MCSs. The scientists then used the dataset and algorithm to examine how MCSs may change by the end of the century in a climate that is approximately 5 degrees Celsius (9 degrees Fahrenheit) warmer than in the pre-industrial era — the temperature increase expected if greenhouse gas emissions continue unabated.